With two trips through the dungeon completed, it was on to the third and final challenge in New Game Plus Plus (NG++) difficulty. There are a couple of reasons to undertake a third run through this game, as opposed to stopping after only two attempts (or just the first one!) For starters, the gameplay shifts to become significantly harder in NG++ mode, with all monsters upgraded to their highest palette-swapped tier of difficulty. Those cute little skeleton bone throwers from the initial Normal mode are now terrifying death dealers that toss out almost a dozen bones per cycle. 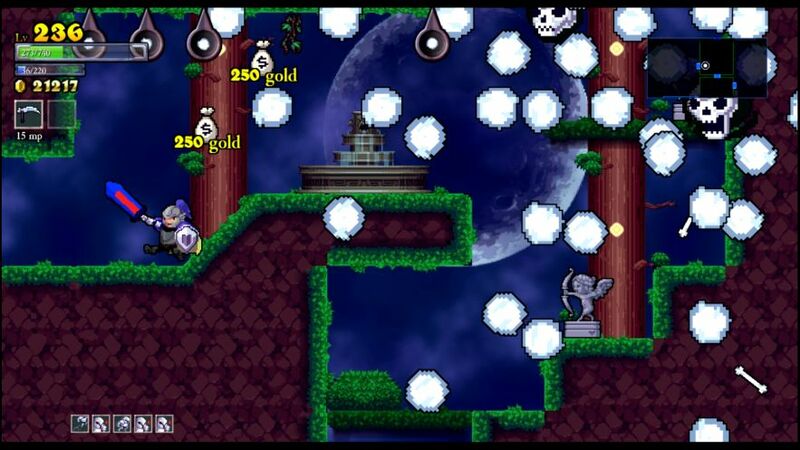 The eyeballs and pointy stars fire off a sea of projectiles that turn the game into a bullet hell. 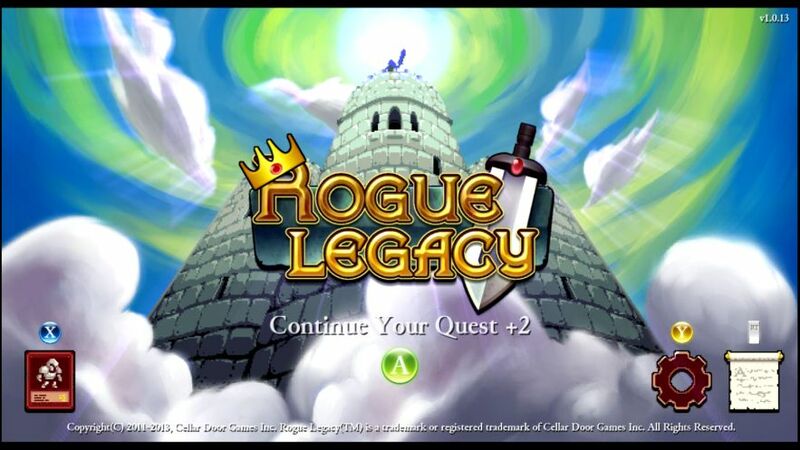 Just as you have to play on Hell difficulty to experience the true challenge in Diablo and Diablo 2, you have to venture into NG++ mode to face the depths of the true dungeon in Rogue Legacy. In addition to this, the last couple pieces of equipment won't drop in New Game Plus difficulty. At least, I've never seen any of the "Black" gear appear when playing at that level, and I presume that you need to be in a harder game mode for them to drop. It also takes about three trips through the game to max out character stats on the upgrade tree; my first non-variant run was just beginning to hit the upgrade caps when finishing NG++ mode. And it also takes about that long to acquire all of the runes in the game from fairy chests. Finally, there's a reason why so many books and movies and so on are done in the form of trilogies. We humans have this liking for the number three, and it's very archetypal to group a progression of things together into a trio. Not to mention, I do like continuing the comparison between Rogue Legacy and the threefold difficulty of the past Diablo games (Normal, Nightmare, Hell - we'll leave aside the poor implementation of D3's Inferno). All of this suggested that I should look to play through the game three times, and stop there without going any further. The gold from that previous NG+ run went into maxing out Critical Strike chance, twenty upgrades there, taking it up to the maximum level of 25/25. The rest went into eight straight Armor upgrades, leaving it at 49/50 in that category. I actually did not have enough gold to unlock the Slayer Sword, since it all went into upgrades with only a few hundred gold left over. Starting over again in the castle was an interesting experience, as NG++ is where the game starts to turn into a bullet hell. 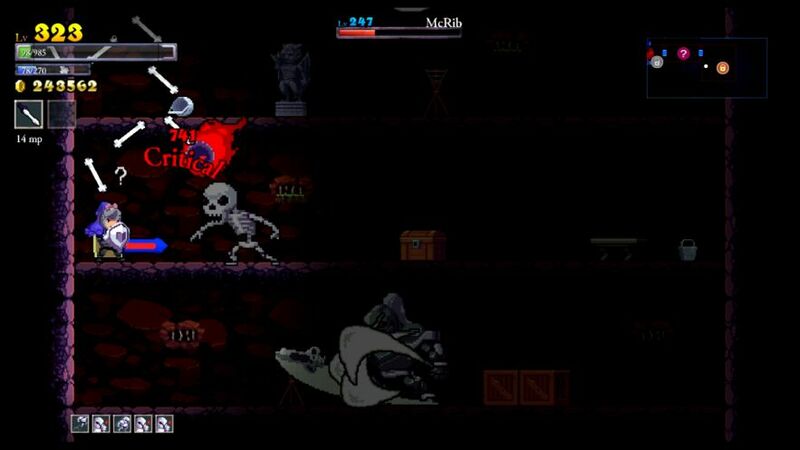 All of the enemies are the most advanced form of their particular type, and the skeleton bone throwers and the eye monsters become complete death traps in this setting. It also takes a ton of hits to kill anything; without critical strikes, this would have been nearly impossible. I was pleasantly surprised to make it through the entire castle and even get into the beginning of the forest, although only by eating every chicken at the boss doors/entryways. Better than I was expecting though. I also found the Slayer Cape, swapping over to that and the Slayer Sword at the end of this run. I used the rest of the gold to max out the Armor upgrade, pick up some more Attack upgrades, and dump the rest into Crit Damage. The net effect was to decrease raw damage and armor slightly, while greatly increasing critical strike chance (62%) and damage (210%). Savant, Alektorophobia. This run had a pretty brutal trap in the entrance room, which I managed to get through with some difficulty. I soon fought the dual floating mages miniboss (Amon and Barbatos), which actually was fairly easy here on NG++ mode. 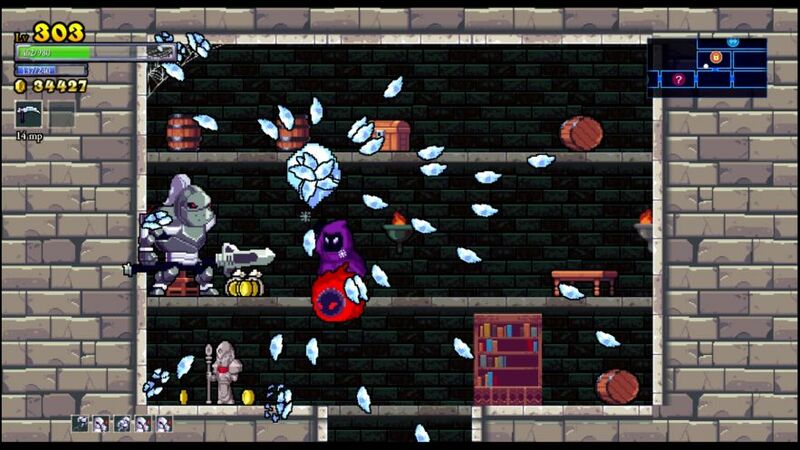 They are only slightly tougher than the normal floating mage enemies by this point. The reward for winning was the Royal Sword, a great find! That has the highest base damage value in the game. This character didn't fare as well as the last one, and couldn't manage to get through the castle. Baldness, Endomorph. 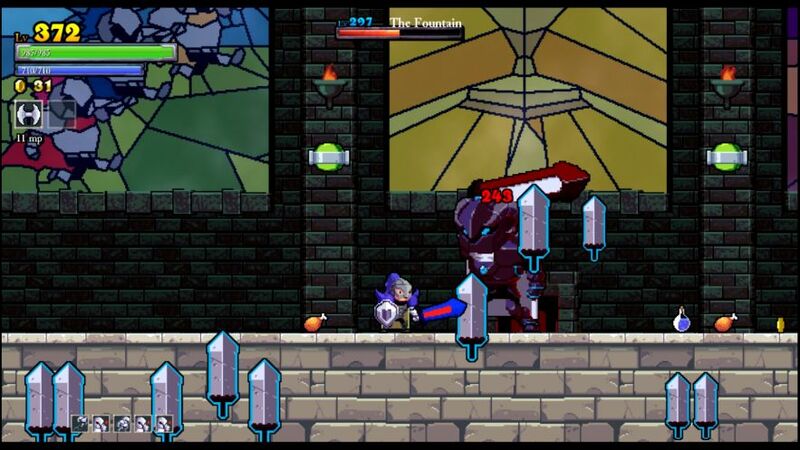 I liked how my character now had the swanky bright blue and red Royal Sword graphic. This run really achieved nothing of note and died early in the castle. NG++ mode can be brutally difficult sometimes. Minimal upgrades went into more damage. No personal traits at all, a real rarity in this game. I tried my best to clear out the castle, but only got through about a dozen rooms before falling in the forest. Much of the time was spent frantically running from door to door trying desperately to stay alive. 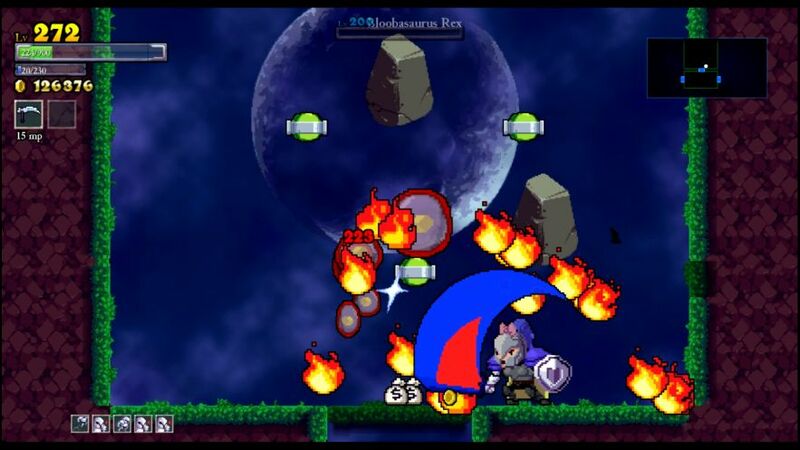 The challenge level is pretty ridiculous, projectiles absoutely everywhere and Vampirism insufficient to keep up and sustain through the damage taken. Rooms like the one above can make for a laughable difficulty sometimes. Not much to do other than keep trying and grind up more stat bonuses to become stronger. I wanted more Health to try and survive longer, put all of the gold from this run into that stat. Dwarfism. The smaller character model helped me to dodge incoming projectiles, but I still wasn't able to clear out the full castle despite picking up 60k gold on this run, and I thought that I played very well on this character run. 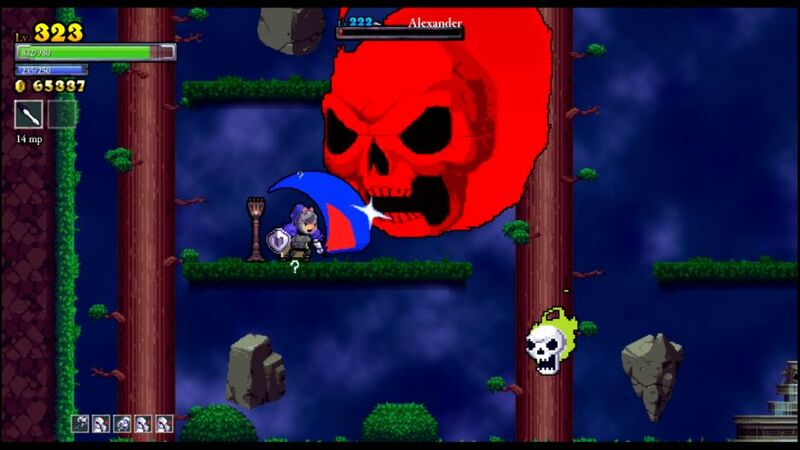 The number of hits required to kill the enemies makes it extremely tough to avoid taking more damage; it's one thing when you're killing the flying paintings in one or two hits, a world of difference when you need to hit them four or five times without being hit in return. This mode is really, really tough. I split the upgrades between more damage and more health. Just have to grind up for a bit, I suppose. Endomorph. Not too much to say about this run either. The highlight was clearing out a room full of enemies for another fairy chest and rune, but of course I lost several hundred health in the process. Only six more runes needed to max out the full set. I was getting plenty of gold on these runs, but was not able to make it very far due to the insane damage output of the monsters. I may have to go into boss rush mode using the Architech to lock the tower, we'll see. Color Blind, P.A.D. The black and white coloring from this trait hurt my eyes after a while. This run made me cry: two chicken drops in the second room when I had full health. The RNG giveth, the RNG taketh away. This round was actually going quite well, and when I found the castle boss door, I decided to give Khidr a shot, not least because I had the PAD trait to avoid spike damage. Well he turned out to be a total cinch, and I only took two hits (the last one as I delivered the final blow), winning the battle with 700 health remaining. Ha! Looks like the random monsters are tougher than the bosses here in NG++ mode. Almost like we're playing Hell difficulty in Diablo 2 again. Rewards for winning were an Armor boost and two MP increases. I managed to full clear the castle with this character and get more than half of the forest completed as well. Now that was partly due to an absurd number of chicken drops, way WAY more than normal, but also due to the added damage that I had been stacking up. You take significantly less damage when killing monsters in two hits than in four or five, and when I rolled lucky with the critical strikes (58% crit chance), I found that my Paladins could take out many enemies in those two hits. Nearly managed to hit 100k gold, which would have been nice. Gigantism, not the trait I wanted when trying to dodge stuff. 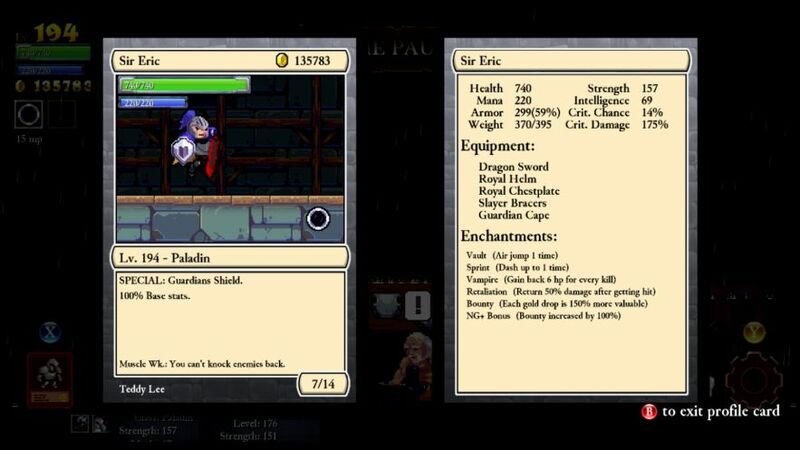 I had to kill off three straight Miners though before getting this Paladin, so beggars can't be choosers. The Gigantism trait actually worked much better than expected, as the huge sword (seen above) was very useful in pushing monsters back away from my character. 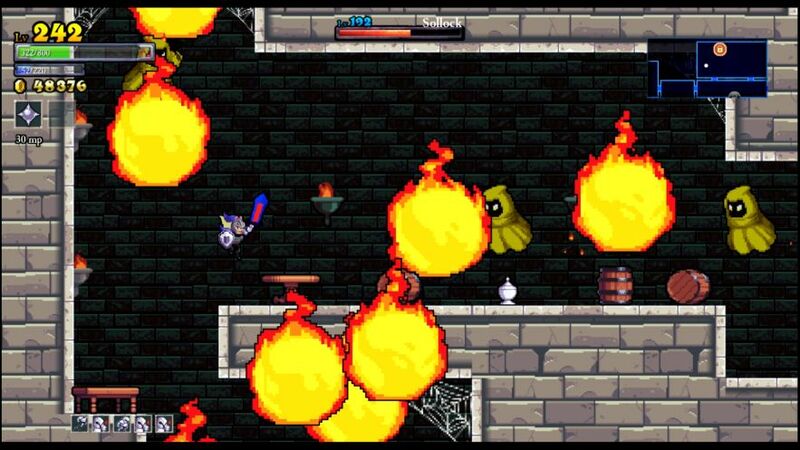 Dodging the flying mage projectiles was not fun though. Anyway, this was the first character in NG++ mode where I felt as though I could truly run the dungeon, not simply run in terror from room to room. This Paladin cleared out all of the castle and forest, and even some of the tower, accumulating a massive 128k gold in the process. With even more unlock gold maxing out both damage and health (75/75 each), I felt confident that I could win against the remaining bosses. If only I could reach them with enough health to take a true shot! Use of the Architect may be needed, we'll see. I still hope to get a clear run through the dungeon. Near Sighted, O.C.D. That blurriness in the distance is really annoying. This run started off very well, as I managed to make it through the castle with sustain roughly keeping up with the damage taken. Ventured into the tower as soon as I found the entrance, and I quickly fought the dual skeleton miniboss again, which seems to get easier and easier with more practice. A victory there produced the Holy Sword, outdated now but the first new piece of equipment in some time. I spent most of this run trying to clear out the tower, and that might have been a mistake, because the monsters there were definitely more difficult. I was hoping to find the boss tower to Ponce de Leon, and never found it. I felt like this was a bad run, but it did still clear 75k gold, which was pretty decent. Unlocks went into getting the increased invulnerability time after taking a hit (very valuable) and the points on the tree needed to reach it. 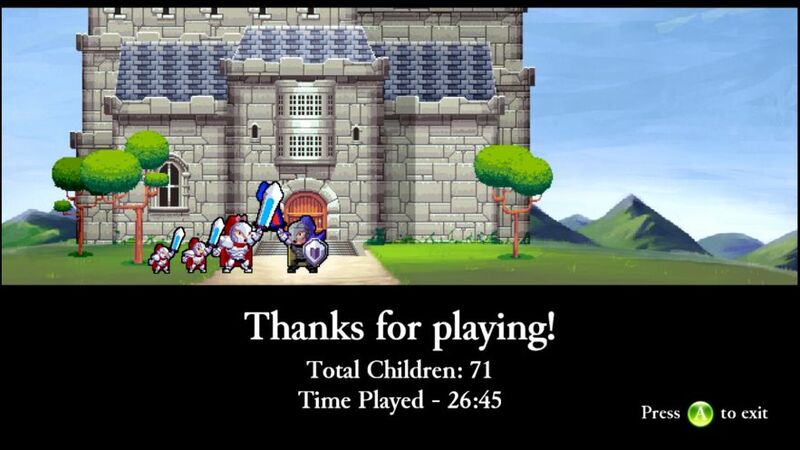 Plus Randomize Children to make grabbing a Paladin somewhat easier. Ectomorph, P.A.D. Another good run from this character, clearing out all of the castle and most of the forest, but I couldn't find the boss door in the forest before I was killed off. This was the first time that I was able to get real use out of the Paladin down-shield ability, which turns them into a statue (like the Super Mario Bros 3 Tanooki Suit ability) at the cost of constant MP drain. I employed that to get out of a bad room with enemies swarming me. This run can be viewed with commentary on my YouTube channel, here's a link to the video to see one of these runs play out in real time. Anyway, since basically everything has been unlocked by this point and there's not much point in accumulating gold, it's time to go into boss rush mode. I will use the next character to find the forest boss door (hopefully!) and then start using the Architect to lock the dungeon down. There's not much point in doing endless runs, since my Paladins are not going to get noticeably stronger from this point on. I was probably highly overleveled for this fight, because Alexander went down really fast and I didn't drop below 800 health. OK, easier than expected. Rewards included bonuses to magic damage, strength, and mana. Since I now had the forest boss down, I teleported over to the tower entrance and began clearing that out as well. Found the boss door after doing about half of the tower, and faced Ponce de Leon, who hit me two times before collapsing in flames. My Paladin still had well over 700 health remaining. Ummm, maybe I overestimated these guys a bit? Rewards were health, magic damage, and mana bonuses. From there, I headed down to the basement, my first time there in NG++ mode, and began searching for the boss entrance. Once again, I found it about halfway through the basement, and went inside with full health after raiding all the previous saved chickens. I fought this battle quite poorly, possibly my worst Herodotus battle yet, but I had enough max HP to tank through for the victory with 300 health remaining. Rewards were essentially useless, one magic damage increase and two mana increases. Bah. At that point, I simply went back and started full clearing the remaining parts of the dungeon. I made it through the rest of the forest, and the rest of the tower, with some frankly incredible luck along the way. Every time I was about to die, a chicken would drop right at the moment that I needed it. Finally, my Paladin fell in the last room in the tower... only to roll a Death Defy at miniscule odds and come back again! I finished that room for a full tower clear, and then went back down to the basement for even more gold. Eventually this character did die, but not before clearing 243k gold, my personal record for any character by a gigantic margin. Pictured above is his last stand, just before falling in the deep depths of the basement. What a run!!! Only the final bosses left to go now. There was sadly virtually nothing to do with that gold, I grabbed the last potentially useful upgrades and dumped the rest into FORTY FOUR mana upgrades. Coprolalia, Hypergonadism. The first trait does nothing (your character swears when hit), the second grants extra knock back. Very useful. It was pretty hilarious seeing my Paladin now walking around with 700 mana after being around 200 mana for literally the entirety of NG++ difficulty. Uh, don't be afraid to spam that shield as needed! This final Paladin proved to be extremely anticlimatic in fighting the final bosses; the extra knockback made it laughably easy to defeat Johannes, who only managed to hit me one time. The following Fountain battle was barely more difficult - I think it hit me twice, and then only because I was hurrying through it quickly. I won the battle with full health and an unused chicken still sitting on the ground. Yikes. Not much drama there, nothing like the earlier boss battles. I must be getting better at them, that or this Paladin was far too overleveled. OK, maybe both. These were the final stats for my Paladin at the end of this three dot run. The biggest difference maker was upgrading damage through critical strikes; without the ability to crit, the final runs through the dungeon would have been almost impossible. 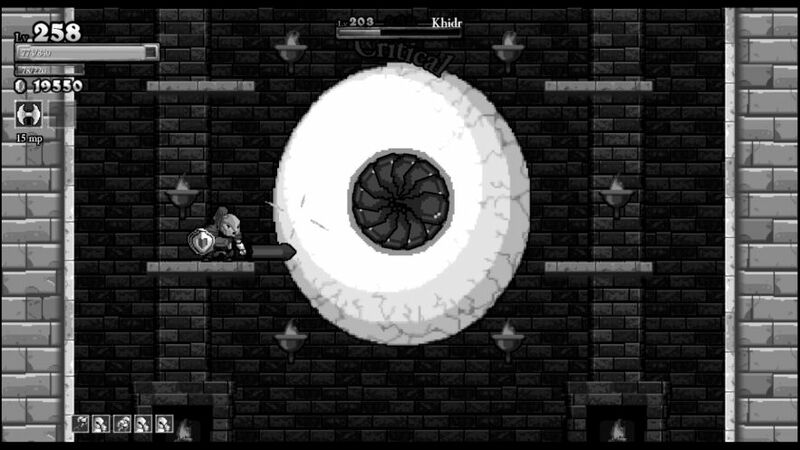 The monsters simply have too much health to take down through normal means. I wonder what this will mean for the magic classes that primarily rely on spells to deal damage? Spells can't critically strike, after all. I guess that we shall see in time! I wound up wearing a combination of Royal and Slayer gear at the end of the game, and I never had any of that "Black" gear appear. I'm not sure if that was bad luck or if they require playing on NG+++ to drop. Pretty much all of the rest of the equipment had appeared at some point in time. I did very little of interest with runes, simply taking the double jump, dash, and three Vampirism runes for sustain. Perhaps other classes will require something different there, the Paladin didn't need very much creativity. 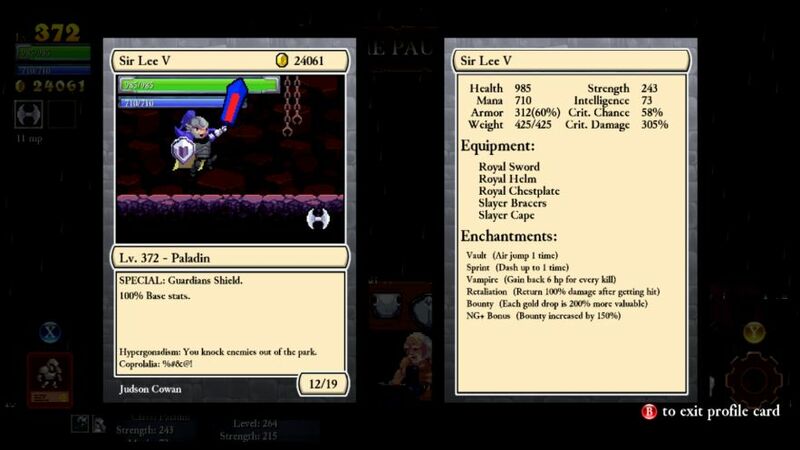 It was fitting that this Paladin was named Sir Lee the Fifth. The starting character is always named Sir Lee, after the programmers who designed this game. It felt like I had come first circle with this Paladin Legacy. In total, I used 40 Paladins to complete the game in NG++ mode, unfortunately having to kill off 31 other heirs who rolled the wrong character class. Err, sorry about that! Is that a good number or bad? I honestly have no idea, since I have nothing to compare it against. My characters almost certainly ended up overleveled for the final bosses, but I was never deliberately trying to grind with these Paladins. I tried to complete as much of the dungeon as possible with each individual heir, and then spent the resulting gold wherever I thought it was most useful. I also avoided using the Architect at all, which I think was the correct decision in retrospect. The game is simply more fun when the dungeon is random on each new attempt, and you have the additional challenge of needing to find the boss doors in each area, as opposed to just teleporting to them at the start of a run with full life. Where's the fun in that? I don't even enjoy the bosses all that much. 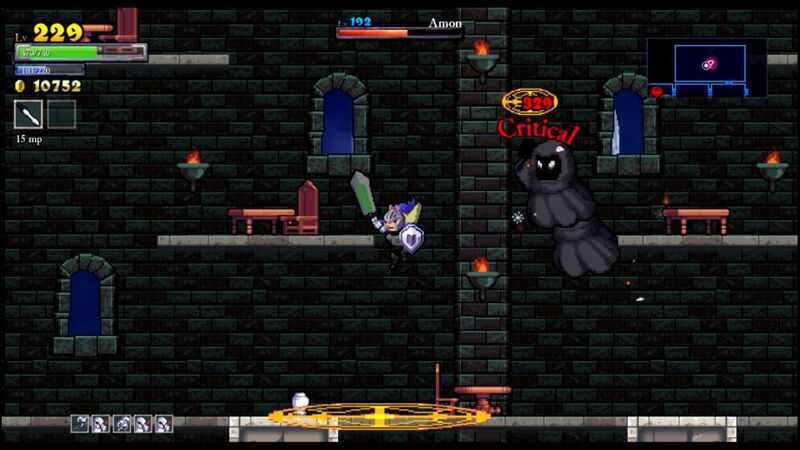 For me, the entertainment value of this game lies in the dungeon itself, clearing areas and surviving its challenges. I finally managed to get a near-complete run with my penultimate Paladin with that 243k gold total, and at that point I felt as though I had finally "beaten" NG++ mode. Just clearing the bosses would not have given me the same satisfaction. That brings this particular challenge to a close. 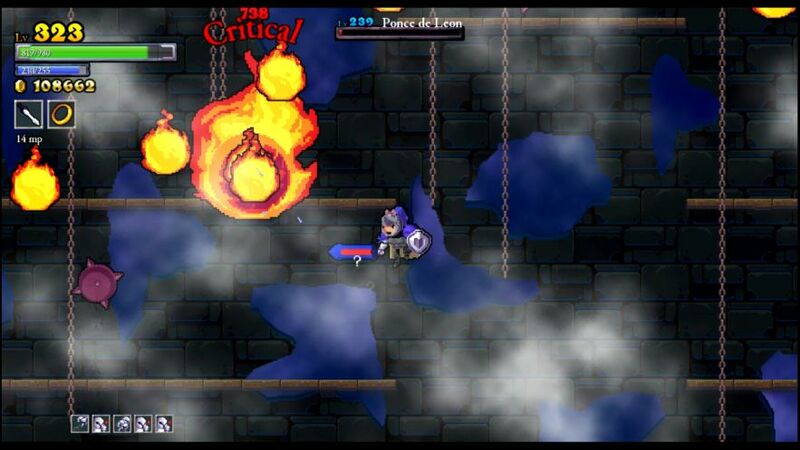 Rogue Legacy will continue to generate more dungeons in ever higher NG++++++ modes until infinity, but I would argue that there's no real point in going beyond NG++. The main reason is that the gameplay ceases to change after going through a third time; although the monsters will keep getting more damage and higher health totals, the enemy draw is exactly the same as it is in NG++ difficulty. The first three trips through the dungeon are all significantly different, but nothing changes after that. While you can keep clearing the bosses over and over again, I don't think there's any real point. Better to be satisfied with a clear of three difficulties and move on to another challenge. My next goal was to repeat this challenge with the Archmage class, which would play out in a very different fashion. What sort of new roadblocks would that entail? I had no idea, but I couldn't wait to find out.